Currently, over 500 million people around the world use Instagram every day. One can only guess how many different signals the platform users send every day. Instagram users mute publications of former classmates whom they are too polite to unfollow, send hundreds of emoji to stories or live videos of favorite celebrities, share posts from meme pages to friends’ DMs, and express their emotions through other tools from the rich arsenal of the Instagram mobile app. Since the platform has long been warmly welcoming brands, the user’s signals in regards to what they like are read not only by their friends. Instagram businesses use them for a better understanding of what their potential clients want, what will capture their attention and sincere interest. Having such information on hand, ultimately, is a key to success, so if you want to achieve tangible results through marketing on Instagram, you need to monitor your Instagram account metrics closely. Instagram Insights provides some information about your account, but overall it’s just basic stats about the posts, profile views and conversions. Time intervals for which information is given are limited to the last week only; Instagram analytics can only be accessed from a mobile device with Instagram account type switched to Business. Luckily, there are plenty of different services providing quality Instagram analytics for accounts of any type, plus adding some handy functionality on top. Let’s overview some of the best tools for the task, skipping already well-known and hardly affordable for small brands, and see what they may bring to the table. 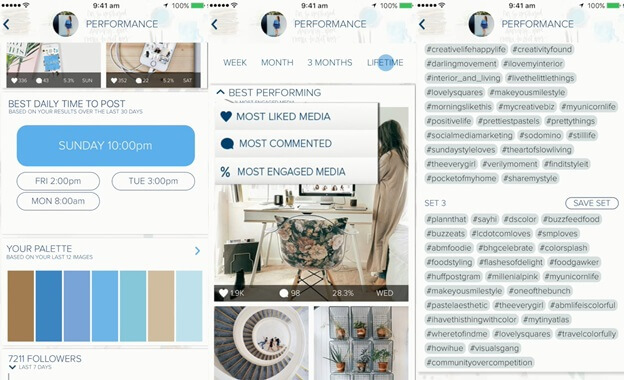 Essentially, it’s a visual Instagram planner, though the application’s functionality range goes far beyond curating the feed and scheduling the publications in an aesthetically pleasing order. Plann provides analytics on the color schemes your followers like the most, best-performing hashtags and posts. The Sneaky Peek feature allows comparing user stats to the competitors’, stealing hashtags they used, and finding out their best time to post. Note that Plann doesn’t really auto-post Instagram publications for you, but it sends you a push notification reminding it’s time to post. Users can upload multiple photos at once to the application and then drag and drop the image grid, arranging it to their taste. Image editing, video uploading, carousel posts, Dropbox and Google Drive supported. Pricing: Free plan; Paid plans cost $6-$18 if billed monthly. Created as an alternative to ruthless Instagram activity automation bots and pricey professional marketing services, Combin takes care of mundane tasks and provides tools for convenient and fast target audience search and attraction. 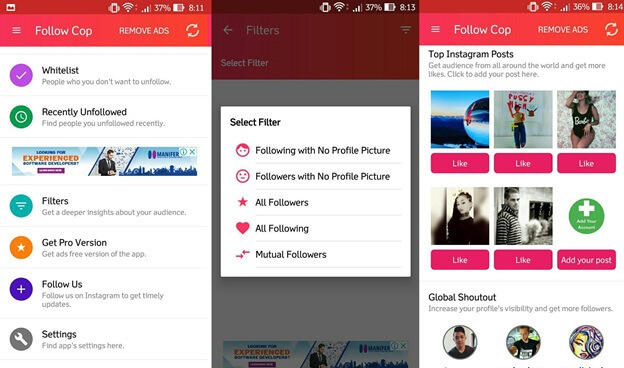 The application helps to find interesting Instagram profiles and publications, filtering out interaction inefficient accounts, and engaging with current and potential followers en masse. 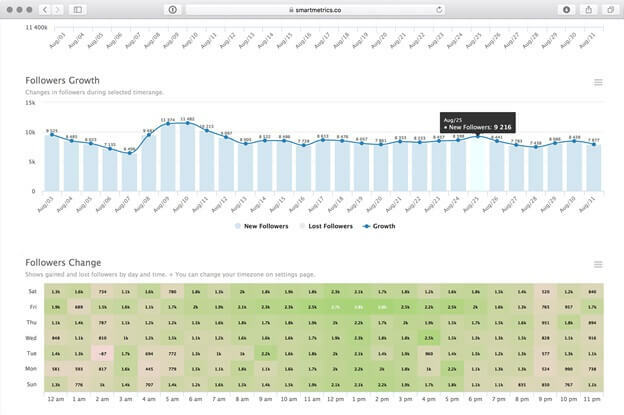 Hovering the cursor over graphs reveals more specific information about the account growth. Pricing: Free plan; $10 for Personal plan (1 Instagram account), $30 for the Business plan (5-15 accounts) monthly. Even though SmartMetrics provides only Instagram business accounts analytics with no additional features for account management and marketing, it has a lot to offer stats-wise. The service gives informative reports on user account and their competitors’ alike: age, geography and demography analytics, engagement rates of stories, posts and profiles. All are updated hourly and can be exported to CSV and PDF. Pricing: Free trial; $9 for 3 accounts, $19 for 7 accounts, $39 for 15 accounts monthly. 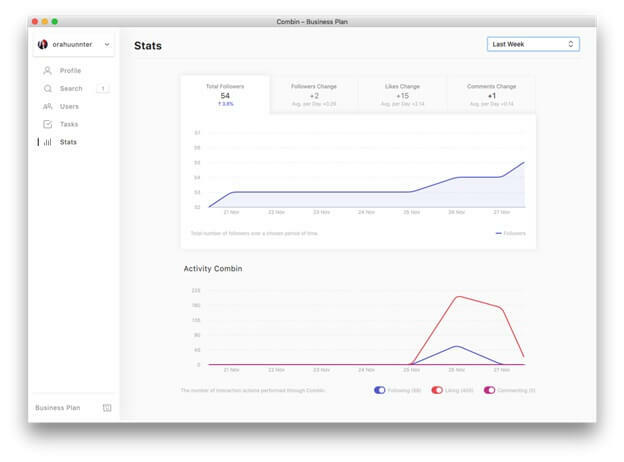 This application for iOS is created for monitoring audience activity and growth on the go. Command suggests relevant hashtags to use in future posts’ captions, rates your engagement rate, comments to likes ratio, post frequency, and reports growth progress. It analyzes publications performance and shows detailed information about them (user and location tags usage, number of likes and comments, engagement rate). Pricing: Free version; Premium ranges from $9.99 monthly to $59.99 annually + purchases of separate premium features are available – $2.99 for Like for Like Detector, $1.99 for Ghost Followers Tracker, etc. This is a utility tool for Instagram audience tracking and management for Android. Follow Cop finds fake account among your followings and followers, accounts that don’t follow you back and determines fans (accounts you don’t follow back). It shows your recent unfollowers, top likers and commenters. The application allows whitelisting important accounts to avoid accidentally unfollowing them. Multiple account management is supported. Follow Cop includes unique Global Shoutout functionality that lets you feature your profile and posts on the application’s main page for a fee of either real money or in-app currency. Follow Cop’s user exchange follows and likes for quick visibility and engagement boost. Pricing: Free version with *lots of* third-party ads; $4.99 for Pro version. How Smart Contract can Make our Life Better?